For the second year in a row, H.J. 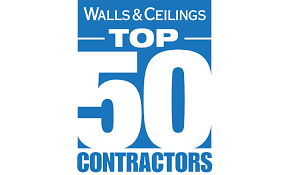 Martin and Son has been selected to the esteemed ‘Top 50 Contractors’ list of Walls & Ceilings magazine. Widely regarded as the leader in coverage of the walls and ceilings industry, the publication has chosen its annual list since 2013. The Walls and Ceilings division of H.J. Martin and Son reached its apex this year, hitting full capacity with the largest drywall project in company history, the new Marquette General Hospital in Marquette, Mich. Roughly 120 employees are on the Marquette job site at any one time among 145 divisional workers. Built under the guidance of general contractor Skanska Closner, the new Marquette General Hospital is a state-of-the-art, 500,000-plus square foot facility with 265 beds. H.J. Martin and Son is handling a wide range of work on the new health structure, including Gypsum Drywall, Cement Board and Exterior Sheathing; Metal Studs and Framing; Tape and Finish; Sound and Thermal Insulation; Installation of Hollow-Metal Door Frames; Lead-lined Drywall and Radiation Protection; and Acoustical Ceiling Systems. The Drywall division of H.J. Martin and Son – today known as Walls and Ceilings – came into existence in 1984, when Martin went to purchase a forklift from a local drywall company that was liquidating its assets. After a conversation with a former employee of the closed business, he decided to start a new division within H.J. Martin and Son. The implementation of a drywall division ultimately positioned the company for later success as a national interior contractor. H.J. Martin and Son today works on behalf of many of the best-known retailers in the U.S. Its specialties include commercial metal-stud framing, drywall installation, drywall finishing, acoustical ceilings, specialty ceilings, operable partitions and acoustical wall panels.